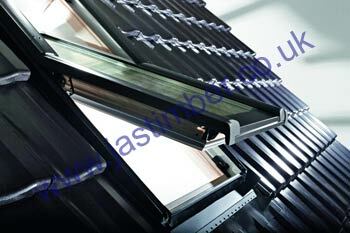 - Safety glass on the outside, thermal insulating glass on the inside. The internal frame is manufactured from foam-filled and steel-reinforced White PVC components, and has weatherproof external aluminium cladding. Put intelligence on your roof with RotoTronic white uPVC Roof Window. The Designo R4 RotoTronic roof window with integrated drive unit and control technology leaves nothing to be desired when it comes to modern living quality. The plug-in solution includes all components for automatic opening and closing – “Plug & Play” is the motto. Sockets are available for internal electric-blinds, and for external shutters­/sun-blinds. RotoTronic – life can be so easy.